CR-091. Vasily Shcherbakov. 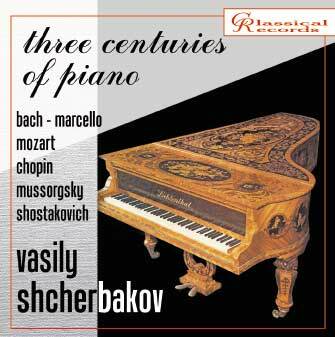 3 centuries of piano - Classical records - compact discs with classical music, CDs online shop. The disc you are holding in your hands is a part of "Three centuries of piano" series; its aim is not to cover the vast piano repertoire; it is rather an attempt of revealing certain important and valuable trends in piano music development. In our opinion, one of the major driving forces behind art as a whole is creative improvisational and fantasy source, or idea, innovation, which is naturally connected with tradition, and realization based on precise fixing of those fleeting processes especially peculiar to music. One may also mention that accents in the idea-to-realization ratio change in historical retrospective. This selection features works that, in our opinion, are of novel and fantasy, as well as aphoristic and precise nature. D. Shostakovich's Aphorisms, op. 13 were composed between February 25th and April 7th of 1927. The composer described the style of his works of the period in the following way: "I had a goal of finding a new style of piano narration in chamber instrumental compositions. I partly managed to do this in Aphorisms which feature exceptionally polyphonic and multi-voice style." It is worth mentioning that the cycle was written immediately after Shostakovich's appearance as a pianist at F. Chopin First International Competition in Warsaw. That is probably why four of the pieces were given such Chopin-like names as nocturne, funeral march, etude, and lullaby. F. Chopin's Lullaby (Berceuse), op.57 was named at the moment of its publication in May 1845. The original title was "Les variantes". Apparently this composition was first performed as an impromptu and sketches twice in February 1844. "First he played a beautiful Prelude, then Lullaby ("Les variantes" - artist's note), then Mazurka, then again Lullaby, which, as m-me Gofmanova presumed, must have been the way angels used to sing in Bethlehem" (from Bogdan Zalessky's diary). It is, in a way, a lullaby fantasy, based on alternation of variations resting on a single consistent bass, and taking us further and further away to a dreamland. R. Schumann's "Toccata" is still considered to be one of the most challenging piano works. Composed in 1830, it was re-composed in 1833 and dedicated to a friend of Schumann's, Ludwig Schunke, a composer and pianist himself, whose talent may be assessed through Schumann's opinion of him. Describing a foreigner's visit to him and Ludwig, Schumann says, "Imagine my surprise when he (Schunke) played him a toccata with perfection, and confessed to me that he had overheard it at my house several times and had learned it secretly without an instrument, in his head." One may only guess what impression this composition left on contemporaries. However, the undoubtedly striking thing about it is the steel power with which toccata's musical imagery flashes by at a breakneck speed smashing the habitual world of sounds into a thousand pieces. It was a new musical manifesto of speed. Whether a mere coincidence or not, beginning in 1829-1830 triumphant and, at the same time, horrifying locomotive races swept England and the rest of Europe. "In the train's window, through the glass, one could see shatters of the world flying by, a world smashed to pieces. It was an endless flow broken up into thousands of instant images. It was a world torn apart from the inside by some invisible force" (Alessandro Baricco, "Castelli Di Rabbia", 1991). "Pictures at an Exhibition", M. Mussorgsky's only large-scale piano work, was finished in the summer of 1874 and dedicated to the memory of his friend V. Hartmann, a painter and architect. It is a sort of a 'piano opera' combining most unusual plots and opposite characters. In his letter to V. Stasov the composer described this work, "Hartmann is boiling with emotions, just like "Boris" used to. Sounds and ideas are floating in the air, I swallow it and eat to excess, hardly having time to scratch the paper... my true face is seen in interludes." A. Marcello and J. S. Bach's "Adagio" is a transcription of the second part of a concerto for oboe and orchestra composed by Alessandro Marcello around 1717. The divine 'oboe d'amore' (instrument of love) improvisation, as oboe transcription for piano was called at the time, becomes more laid-back and ephemeral. Vasily Shcherbakov is a talented versatile Moscow pianist and composer. He graduated from the Tchaikovsky Moscow Conservatoire with honours (in the class of Elena Richter) in 1994. He is a prize-winner of international festivals and contests. Russian, German and American media point out the best traditions of Russian piano school in Mr. Scherbakov's creative activities, among them - the singing quality of piano sound, architectonic performance, possession of time, and the combination of “the passionate heart and cool head”. The pianist's performance is noted for a specially delicate contact with the keyboard, thus creating a unique poetic sound atmosphere. The pianist's repertoire ranges from early clavier music to most recent pieces. The pianist is constantly involved in successful and most interesting solo performances, and has also proved to be a subtle ensemble performer. Vasily Shcherbakov plays in ensemble with the Mikail Glinka and Dmitri Shostakovich State quartets, as well as such well-known soloists as Alexander Trostyansky (violin), Alexander Buzlov (cello), Kirill Rybakov (clarinet), Alexander Galkovsky (viola), Cologne youth philharmonic society's soloist S. Genschaft (violin), and world-renowned theremin performer Lidya Kavina. He also successfully performs with the leading soloists and orchestras of the Bolshoi Theatre, the Novaya Opera Theatre, the Helicon Opera Theatre et al. Mr. Shcherbakov has organized and taken part in a number of prestigious international festivals in Russia, Germany, Lithuania, Latvia, and other countries. Since 2000 he has been acting as the head of chamber ensemble department at the Ippolitov-Ivanov State Musical and Pedagogical Institute. Many of his students are prize-winners of international chamber ensembles' contests and continue their post-graduate studies at the Tchaikovsky Moscow State Conservatoire and the Gnessins' Russian Music Academy. Vasily Shcherbakov tours in Russia, Europe, and holds master classes in Russia and abroad. He was a jury member at numerous international chamber music contests. He has released recordings of solo and ensemble music. Vasily Shcherbakov is a brilliant representative of the young generation of the 21st century musicians. Do you have any questions about CR-091. Vasily Shcherbakov. 3 centuries of piano?